A Different Posy* every weekday. * Our signature daily bunch made from the best seasonal flowers direct from the farm. BY 9 AM WE’LL UPLOAD THE POSY OF THE DAY. IF YOU LIKE WHAT YOU SEE, ADD IT TO YOUR CART. ORDERS ARE TAKEN BY 12PM OR UNTIL POSIES SELL OUT. LOOKING FOR A BIGGER BUNCH? CHOOSE A DOUBLE AND WE’LL UPSIZE YOUR POSY. DON’T WORRY, PAYMENT IS QUICK AND SIMPLE. Welcome to Petal&Post, your favourite Cape Town flower delivery, gift and eventing service. We are an online florist. Send flowers to Cape Town city, northern and southern suburbs, and Durbanville. We just love making people happy with fresh blooms every week! Pre-order online for yourself or a loved-one, or subscribe to send weekly flowers to your home or office, or browse our other products; tea, plants, chocolate and wonderful scented candles. We also offer a full flower and florist service for events, weddings, lodges, hotels, and business functions. 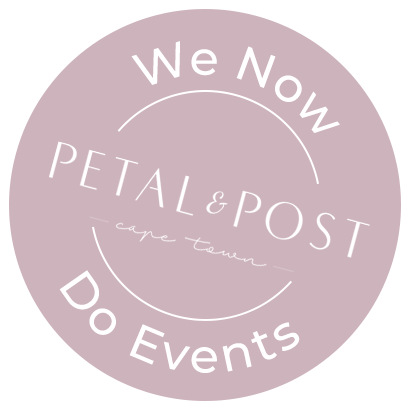 Email: Events@petalandpost.co.za for quotes. SUBSCRIBE TO SEND NEW BLOOMS EVERY WEEK, DELIVERED TO A HOME OR BUSINESS. SECURE YOUR POSY BY ORDERING IT IN ADVANCE.